Thinking of starting a new website? Two preliminary steps are choosing a domain name for your new site and then buying that domain name. Let’s take a look at some of the basics involved in that process. A good domain name is easy to remember and easy to spell. A domain name that’s easy to spell shouldn’t have characters like hyphens between words. It you want more than one word in the name, run them together like alistapart.com or webstandardssherpa.com. It’s a bit awkward to read, but for someone typing the domain name for A List Apart or Web Standards Sherpa in the location bar of a browser, it makes perfect sense. Are you starting a website for an established business? Try to make the name reflect the business name and the branding that is already in place for the business. This may be a bit hard if it’s a commonly used name. For example, a Denver floor tile company might have trouble getting the name mountaintile.com. But perhaps denvermountaintile.com might be available. If it’s a personal website, try to use your name. Karen McGrane owns karenmcgrane.com. How simple is that? If it’s a blog where you’ll be exploring a particular point of view, pick a domain name that reflects your point of view. A name like Mountain Poet or Lesbian Dad tells you a story about what you can expect from the website before you’ve even visited. Before you seek out a place to purchase the domain name, it’s good to have a few ideas ready to go. Your first choice might not be available. Okay, you’ve got some ideas for a great domain name. It’s time to see what’s available for purchase. There are literally thousands of places where you can buy a domain name. I use the domain name services connected to the hosting company where I do business. I like having the domain name company and the web hosting company connected. But I know people who think this is a bad idea. I think the reasoning of the people who think it’s a bad idea is that if one company shuts down suddenly, at least the other one still operates. If you choose an established company with a good history, I don’t think it’s something you need to worry about. If you search for domain names on Google you get 84,000,000 results. There are a lot of choices! I’ll just pick one to use as an example. This does not imply that I endorse this company, it’s just an example. 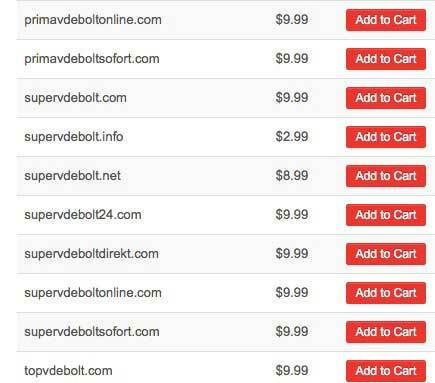 Also, prices vary, so the prices you see in these examples may be different from other domain name sellers. A typical domain name search form. At domain.com, you see something similar to what you see on any site where you want to purchase a domain name. You enter the name you are hoping to purchase. The site will tell you if the name is available. If it’s not available exactly as you want it, the site will suggest alternatives that are close to what you want. I searched for vdebolt.com, my own domain name. Here’s what the tool told me. The .com is gone, but other top level domains for that name are available. If the name you want isn’t available, choosing whether or not to go with a .net or .org or some other .whatever is an option. A few of the suggested variations on my domain name. Even better, create your own variations like the denvermountaintile.com example and use the search tool to see if it is available. If you can’t get a name close to what you originally wanted, go back to step one and brainstorm a new idea. Keep trying until you eventually find a name that will work and is available. You can buy the name for 1 year or for several. You’ll probably save a few dollars if you buy several years at a time. Don’t forget to renew it on time, or you might lose it! You’re all set. Go build something awesome. I prepared a booklet (PDF) of materials that I use to teach a short class in web accessibility. There really isn’t a great resource for a class in web accessibility that covers the basics in just a few hours. I took some of my handouts and made such a resource for you. It’s a free download. Get Accessibility Teaching Resources now. Free! to teach both the basic HTML and the CSS class. This version of the book came out in 2011. There’s an 8th Edition released in 2013, but we haven’t switched to it yet. I’m sure we will soon, but for the moment, we are using the 7th edition. Here are a few teaching tips if you are using the 7th edition, as I currently am. At the time this book was written, there was no <main> element in the spec. I suggest you change the layout suggested in Chapter 3 to use the <main> element for the left column. Use the landmark role role="main" with it. Chapter 3 contains a clear explanation of the purposes and uses of both the <section> and <article> element. If you want, you can include an example of these two elements inside the <main> element. Remember that <hgroup> has disappeared from the spec. The example files all show empty elements such as <img> with a closing forward slash included: <img />. This provides a perfect opportunity to talk about backwards compatibility, XHTML, and some of the personal choices that are acceptable when writing HTML5. Why have a wrapper div? Students may have a problem grasping is the need for a wrapper div. I frequently find myself explaining it numerous times until the message finally sinks in. The metaphor I’ll use today will be to compare a wrapper div to a fence. It demarks the edges of your property. It contains animals or children within a prescribed area. It keeps them from getting out. It creates a border between one area and another. It can be plain or decorative. A wrapper div in an HTML document does the same things but to a layout instead of to actual property. The wrapper holds a design within certain boundaries. The various areas of a design cannot escape from the boundaries set by the wrapper. A max-width or min-width or varying width based on an @media query can be set for the wrapper that makes it size a design responsively. The id identifying a wrapper provides a CSS hook which enables more than size constraints. Borders and other decorations can be added. With a wrapper div in place, a layout can be centered on the page. The width of the design can be controlled for easier reading and line-length. One of the principles of HTML5 is to pave the existing cow paths. Hence we have all sorts of new semantic elements like header, main, and footer that were once created using the same div with an id technique. If wrappers are so great, why isn’t there a new HTML5 element called wrapper? I don’t know the answer for sure, but I’m guessing it’s because a wrapper is not a semantic element. It’s merely a container, a boundary into which you place all your semantic content. By the same token, there is no ARIA landmark role for wrapper or container divs. The container carries no semantic meaning, it just puts a fence around the content. There’s no need to indicate it as a landmark on the page. The proper use of section and article elements in HTML5 is one of the sticking points to good implementation. If you’re teaching HTML5, or just learning about HTML5, here’s a tip for you. A section element (or an article element) should not be used as a container for styling purposes. However, any time you have some content that needs a heading or h1, h2, etc. at the beginning, sections and articles are semantic candidates for proper markup. If what you are doing is wrapping something up in a container with an id or class that will be used for anything but content with a heading at the top, you should use a div. A div is, by definition, a generic container. It carries no semantic meaning. It needs no heading element. It is meant to hold blocks of the page for styling purposes. This is worth your time. It’s a talk by Monika Piotrowicz of Shopify. I like her instruction to use basic HTML whenever possible instead of putting something else in to overrule the semantics. Her explanation of ARIA is excellent. The close captions aren’t great. They were generated automatically rather than from a transcript, but they do appear if you need them. Hat tip to Dennis Lembree who shared this on Google+, which is where I first saw it.